For many of us, My Chemical Romance frontman Gerard Way, was a lightning rod for all of our most theatrical teenage expressions of angst and weirdness. With his Tim Burton aesthetic and neo-Brontë themes of tortured souls and demonic pacts, Way spoke to those of us who felt hopelessly outside of what was cool or acceptable, offering a new, appealingly melodramatic identity. I personally listened to the album Three Cheers for Sweet Revenge while learning how to sketch murky pits of eyeliner and reading any vampire novel I could get my hands on. My taste in music and passion for doodled-on converse may have changed somewhat, but I still have an appreciation for the offbeat creativity of Way, with his distinctively gothic visuals capable of luring long-grown emos into his shadowy Wonderland. Now a successful comic book writer, Way’s The Umbrella Academy – which he wrote with illustrations from Gabriel Bá – has been adapted for a Netflix series. This tale of ‘a super-dysfunctional family of superheroes’ has been well received by fans of the original comic book series, and has performed well for the streaming giant. The moody cinematography remains faithful to Bá’s gorgeously dark illustrations, while Way’s writing is enlivened by a cast which boasts the likes of Ellen Page, Tom Hopper, Emmy Raver-Lampman, Robert Sheehan, David Castañeda, Aidan Gallagher, Cameron Britton, and Mary J. Blige. 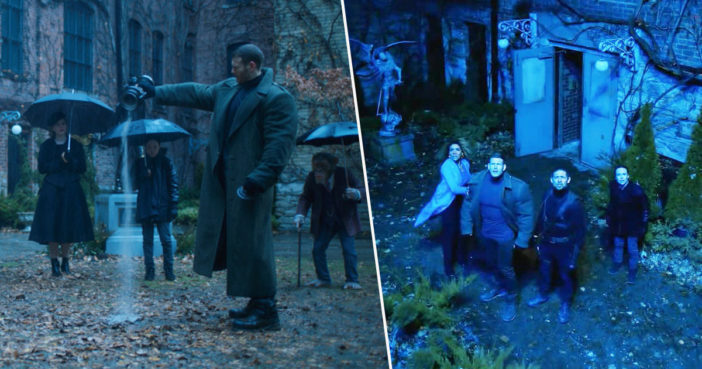 And now, as reported by The GWW, Netflix have officially renewed The Umbrella Academy for a second season. Production will reportedly begin in Toronto later this year. Peter Hoar – who directed both the pilot and the tenth episode of season one – is said to be directing the first episode of the second season. What I did for Steve Blackman and the writers in that first writers’ room was to create an 18-page document that laid everything out. They’re very curious what Gabriel and I are doing next. We always send them the new comics. They really want to know what’s happening. The Umbrella Academy on @Netflix. Obsessed. OBSESSED. I had zero clue what it was because I’m not cool like that, but it’s glorious. What perfectly thrilling melancholy. About to start The Umbrella Academy. I have high hopes. It’s truly a great age for those who like their superheroes to fly in with plenty of style and drama. The first series of The Umbrella Academy is currently available to watch on Netflix, after a February 15 release.